RIO DE JANEIRO, BRAZIL – As technology opens up new options for watching NFL from laptops and mobile devices, it has never been easier to keep up with your favorite teams this season from Brazil. Yet nothing beats watching a big game with friends at a bar full of fans, and Rio provides a handful of great options for expatriates, travelers and Cariocas alike. 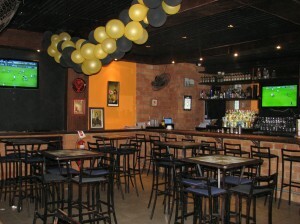 Blue Agave in Copacabana offers the best option for sound in Rio, photo by Blake Sherman. In the second half of the 2012-2013 season, Daylight Savings Time changes mean that Rio is now three hours ahead of Eastern Standard Time (EST), so the Sunday games start at 4PM, 7PM and then the night game at 11:20 PM local time. Monday and Thursday night games are also starting at 11:30 PM or 11:20 PM respectively local time, and while this makes for a fun evening activity, not every bar caters to late-night NFL fans. When expatriate and Blue Agave co-owner, Jason Galeria opened the doors to their Copacabana location, he made it a priority to show the NFL whenever possible. “We show the games on either a 40 or 50 inch high definition TV,” says Galeria. “The crowd is a mix of Cariocas, expatriates, and foreign travelers,” he describes, “There is a core group of Americans who come down to Rio for the summer [in Brazil]. They make up a core of fans who generally arrive in November.” A perfect time in the midst of the NFL season. Shenanigans Irish Pub & Sports Bar has been a standard viewing-ground for NFL in recent years. 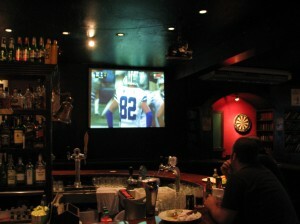 The casual ambiance and multiple televisions offer sports fans several games at the same time when available. They also have a projector for showing games on the big screen, and with the change in ownership, the new owners hope to continue the tradition hosting NFL games, especially their annual Super Bowl party. Watching NFL in Rio is not only about the game itself, but also the sense of community. As the NFL season continues to push on through the current season, the fans get ever more excited and filled with passion. “The best part about showing NFL games is when we get a large crowd, especially with fans from each team. Everyone gets really into the game…” Jason Galeria describes. For the sportsman in Rio looking to watch NFL games from the comfort of their own sofa, the cable networks ESPN and Band Sports normally show just one NFL game on Sunday, competing with Brazil’s endless football (soccer). If your cable package allows you can now also choose to switch from Portuguese to English-language commentary, which goes a long way. Of course with faster technology, anyone with a high-speed Internet connection is capable of watching live-streamed NFL games via NFL Game Pass.